Description: Q: Skills for Success is a six-level series with two strands, Reading and Writing and Listening and Speaking. Q is a result of an extensive development process involving thousands of teachers and hundreds of students around the word. Their views and opinions helped shape the content of the series. Q is grounded in teaching theory as well as real-world classroom practice, making it the most learner-centered series available. Clearly identified learning outcomes focus students on the goal of instruction. Thought-provoking unit questions provide a critical thinking framework for each unit. Explicit skills instruction builds language proficiency. Q Online Practice provides new content and practice activities for every unit. 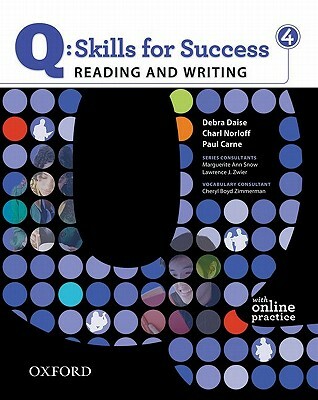 253 Q: Skills for Success is a six-level series with two strands, Reading and Writing and Listening and Speaking.